A person is said to be overweight if they have a Body Mass Index between 25 and 29 and obese if the body mass index crosses 30. Obesity in the United Kingdom has always been one of the leading preventable diseases. One in every four adults in England is suffering from a mild or severe form of obesity, and a study shows the numbers are increasing. 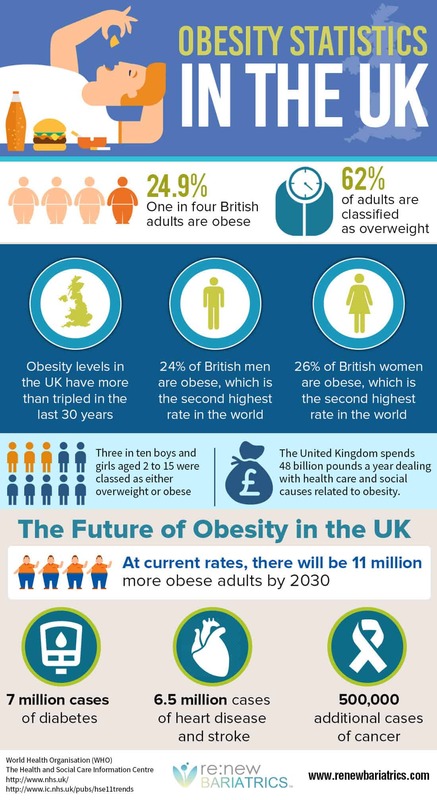 The UK is the leading contributor of the obese population in Europe with an overwhelming contribution of 24.9%. We are here to break down to you the different statistics related to obesity and dealing with it in various aspects such as health care costs, disease, and death, causes and solutions implemented by the government and country. In England alone apart from the 24.9% of purely obese patients, another significant percentage number of 61.7% are either obese or overweight. Another recent study says that the current obesity levels that are prevalent today are three times of what was prevalent during the 1980’s. During then a significantly small number of just 6% men and 8% women were reported to be obese. Susan Jebb in her recent study concluded at the University of Oxford that,” overweight kids are most likely to become obese adults.” Another study reveals that obesity is more prevalent among the poor neighborhoods of London, which is contrary to the common belief. Factors like Income, ethnicity and social deprivation have a significant relation to the number of cases that come up every year related to obesity. Obesity is quite prevalent among British men with a significant number, 22.1%, being obese which the second highest n the world is after Malta. What is surprising is that the figures are far from declining and the statistical institutes have predicted that the number of obese men in the United Kingdom will go up to 36% of people by 2030. The statistics among women are not pleasant as well, with one out of twelve British women are termed as Clinically Obese. The number of overweight or obese has become an alarming 59%. If this trend continues, as more and more women are falling under the category of obese and overweight the numbers will reach up to 64% by the year 2030. According to a study, the United Kingdom spends about 48 billion pounds a year dealing with health care and social causes related to obesity. It is a billion more than what is spent on armed violence and war funds. It has been predicted that 44 interventions could lower down the obesity rates by 20% within a span of five to ten years. This would save around 16 billion pounds a year. Two and a half time more likely to develop high blood pressure which would result in stroke or cancer. Among other facts that are related to obesity and overweight are that people with BMI of 30-35 have a reduced life expectancy by an average of three years, while BMI over 40 can decrease longevity up to 10 years. Obesity has claims over 30,000 deaths a year with 9000 of those deaths are recorded by people before their retirement age. Putting it simply, obesity is caused by overeating and working too little. It has been claimed that the rise in obesity is not due to the abstinent of willpower but because of the main lifestyle-related problems such as “obesogenic environment” that encourages people to eat more and unhealthy. The rise in the usage of cars, computers, desk jobs, high-calorie food, and marketing techniques that motivate you to buy more are the causes of obesity. For the government, the primary task at hand is to tackle and educate more and more of its citizens about the ill effects of being overweight and obese. Governments are encouraging healthier lifestyle with lots of physical activities associated with it. The UK government has tried several times to curb obesity but has failed. So in 2011, it has launched a policy document “Healthy Lives, Healthy People.” It talks about the vision that it has adapted to eradicate obesity by the year 2020. The government has ordered business and private firms to make healthier choices for its clients and customers by its responsibility dual pledges.